Partly due to the tourism boom of recent years, streets fairs in Lima have multiplied, and you are likely to find one near your place in Lima. Some municipalities have their own small popular fairs that are more like a big street market; there are also some temporary handicrafts and/or food fairs that move from one location to another, and some small handicrafts fairs that have mostly been at the same location for years. Depending on the fair and on the season, you may find garments, accesories, bijouterie, etc. However, whether it’s a small, humble street district fair or a big event like the “Mistura” food fair, don’t miss the foods section: go take a look. You will surely get to try something new and probably something delicious, from huge Andean foods like the “carnero al palo” (ram roasted on a spit) to typical bread and pastries from many Peruvian regions. 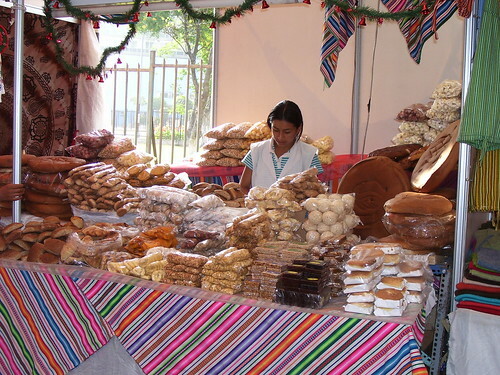 When trying stuff at the bakery stalls, remember also to try some typical and very popular local and Andean specialties such as bolas de kiwicha (balls made with amaranth), the wawas (baby-shaped sweet breads), the pan serrano (Andean-style bread), or the maní confitado (caramel covered peanuts). Great photos!! I love the traditional costumes!